First post of 2012! I’ve managed to go 2 months without writing something here, which is a first for me. Between work, a trip to India (to visit relatives), and the start of some part-time graduate coursework at Stanford, I haven’t found as much time to write as I’d like. I often make grand plans about what I’m going to do but then they fall by the wayside as laziness kicks in. Today, though, I was playing through a few games from the current RSSU Student Grandmaster Cup (part of the Moscow Open festivities it looks like based on the tournament website) and a few caught my eye. American GM Ray Robson is playing and currently is in 3rd place with 5/8. 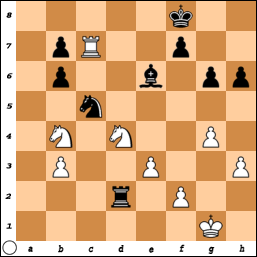 His game today, as white against Andrey Stukopin (2460 FIDE) featured some nice tactics. These small combinations were probably not too difficult for Robson to find, but they make a nice impression I think. Black has just played 17…Nh5?, a novelty according to my now-old databases. It’s a pretty ambitious move: (1) Black puts his knight on the exposed h5-square when White’s queen is still on d1 and (2) contrary to the very “solid” spirit of this Chigorin Ruy Lopez (the Petrosian System, I think), Black is looking to put a knight on f4 rather quickly. The thinking probably was that something like 18.Bxe7 Rxe7 19.Nxe5 dxe5 20.Qxh5 fails because of 20…cxd4. Unfortunately for Stukopin, he forgot about the little zwischenzug of 20.d5!, making an even bigger threat with 21.d6. After 20…Nc8 21.Qxh5, White had pocketed a clear extra pawn. When playing a move like 17…Nh5, I’d normally double or triple-check that I wasn’t missing something – chess rules are meant to be broken, but not all the time! Rather than break through a blocked center, Robson gave back his extra pawn for the initiative. Black’s kingside will be opened up, but things don’t look so dire at first glance. 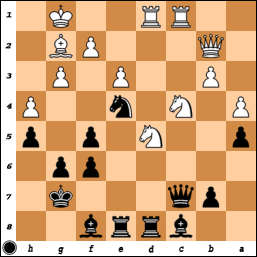 But before opening the kingside, Ray makes use of Black’s weak king! After 32.Bxc4 bxc4, White dropped the hammer with 33.Rxc4! – if 33…Qxc4 34.Qxc4 Rxc4 35.Rd8+, Black is forced to block with a rook, but after 35…Re8 36.Rxe8+ Kxe8 37.fxg7, Black can’t get back in time to stop the g7-pawn. The game soon ended after 33…Rc6 34.fxg7+ Kxg7 35.Qg3+ Kf6 (else the e5-pawn will fall) 36.Rh4 Ke7 37.Rh5 and Black threw in the towel. Another interesting game from today featured a funky knight on h5. This one was between GMs Alexander Ipatov (2586 FIDE) and Yaroslav Zherebukh (2594 FIDE). 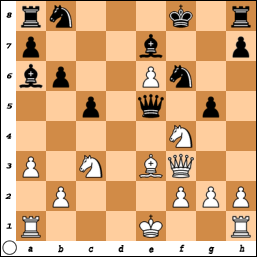 Ipatov seized on this aspect brilliantly, hitting Black with 11.f5!. 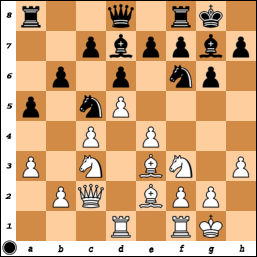 It’s not so hard to see that taking on e5 leaves the kingside decimated after 12.fxg6. Black doesn’t even have the consolation of having good minor pieces there. So instead Zherebukh played 11…gxf5, possibly thinking that White would have to play 12.Bxf5 when he escapes with 12…Qxd1 13.Nxd1 fxe5 (actually, despite his extra pawn, I think he’s the one still trying to equalize, but he’s close). 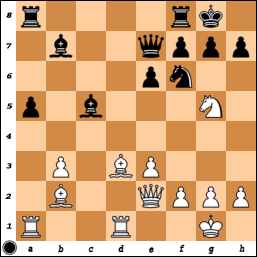 Instead, Ipatov played the real surprising move of the sequence, 12.e6!. Allowing something like 13.Rxf5 isn’t a good idea, so 12…Bxe6 is obvious. 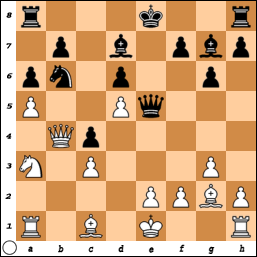 White then simply played 13.Bxf5!. 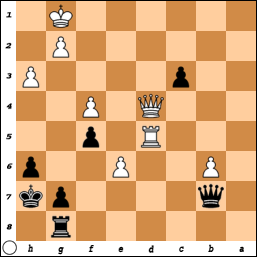 It’s this concept that really caught my eye – after a trade on f5 (note that Black can’t take on d1 first as 14.Bxe6 is check), the Nh5 is trapped! 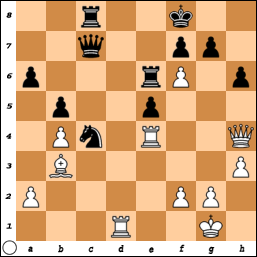 Unfortunately for Ipatov, he threw away his advantage in short-order after 13…Bxc4. He played 14.g4? immediately after 14…e6!, he had a choice of what kind of position to play. If he retreats with 15.Bc2, then Black can play 15…f5! 16.gxh5 Nc6. White is up a piece for 2 pawns, but notice how active Black’s pieces are and how many important central squares are in his control. White’s knights have no outposts and I think the position is pretty unclear actually. Ipatov took the other route, trying for a positional masterpiece with 15.gxh5 Qxd1 16.Rxd1 exf5 17.h6 Bh8 18.Nf4. 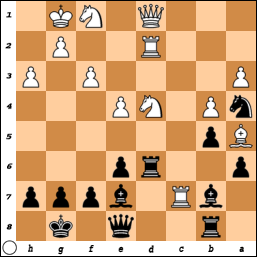 Black’s bishop is buried on h8 (going for something like the live burial of Short – Kramnik, London 2011), but the problem is that unlike that example, the pawn on h6 isn’t completely secure. 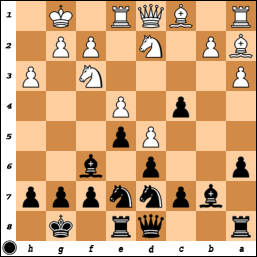 Black maneuvered his knight to f7 when White was tied to the pawn’s defense, so neither side could play with a full slate of pieces. In the end, Ipatov lost the endgame actually. Instead of 14.g4?, I think 14.Qc2 was almost winning. The knight still has nowhere to go, but now the added threat of Bxh7+ means that Black can’t kick the bishop as in the game. He also can’t create space for his knight (…Bh8 allows a mate on g6). After 14…Qe8 15.g4 Kh8 16.gxh5 Qxh5 17.Nf4, White’s pieces swarm the kingside. Comparing this position to the previous one, we see that Black’s pawns aren’t allowed to advance to e6 and f5 and White’s minor pieces aren’t driven back. That makes all the difference and this position should be a pretty easy win for White. Another tough matchup, a morning round against Shabalov, who simply plays everything. Also, he tends to get stronger as the tournament progresses, as he’s made a habit out of playing badly to start off an event, but finishing strong to get back in the money. Elizabeth Vicary wrote a whole article on this topic for Chess Life Online, and it can be seen here. Actually, the same happened in Miami, as he drew in the very first round and was slow to get started. Unlike some other events, though, he also didn’t end up finishing too strong, although maybe I had something to do with that. This was my first real attempt as Black in the regular Slav with my planned 6.Ne5 Nbd7 7.Nxc4 Nb6 8.Ne5 a5 line. He played the currently very popular 9.Bg5! 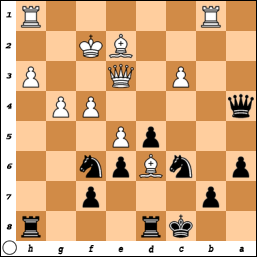 ?, which cuts across Black’s usual plan of 9…e6 because of the reply 10.e4!. (As a side note, this position has been discussed in the current SPICE Cup in Texas, as GM Becerra has championed the Black position a couple times – in both games, he played 9…h6). 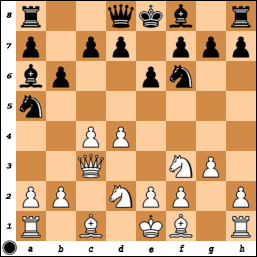 I played 9…g6, which seems to make some sense as alternative way to develop the dark-squared bishop. In his first game, Becerra played the more radical looking 9…h6 10.Bh4 g5 to bring the bishop out, and while he drew without any huge problems, it looks a bit less solid. Shabalov then played a new move, taking on f6 right away. 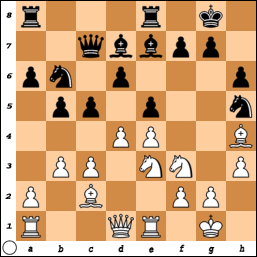 The resulting pawn structure is one that is sometimes seen in the Slav (especially in Nh4 lines, where White takes the bishop on f5), or even the Nimzo (in the Romanishin line with 4.Qc2 d5 5.cxd5 Qxd5, followed by 6…Qf5 7.Qxf5 exf5), but the minor piece arrangement is more reminiscent of the structure arising after the Trompowsky with 2…d5 (3.Bxf6 exf6 4.e3, with c4 and so on). The middlegame featured a lot of heavy, positional maneuvering, but I drifted a bit too much and let him achieve more than he should have been allowed. 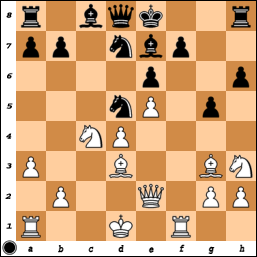 Actually, we reached the following position after 41.Nxd5 (yes, that is move 41!) and both of us were down to just under a minute at this point. The time control was G/90 minutes with a 30 second increment, so there wasn’t too much danger of losing on time, but there certainly was danger of losing because of time. Here I played 41…Qf7, and after 42.Ncb6 Be6 43.Bxe4 (playing 43.Rc7 first is similar, but with Black’s knight on e4, Black can play …Rd2 more easily while White’s king has to go to h2 square because g2 is occupied) fxe4 44.Rc7 Qxc7 (actually 44…Re7! would have secured an advantage for Black) 45.Nxc7 [not 45.Qxf6+ Kh7 46.Nxc7 Rxd1+ 47.Kh2 (47.Kg2 walks into 47…Bg4, threatening 48…Bf3+ and 49…Rh1#) Bg7! 48.Qg5 Rf8, winning] Rxd1+ 46.Kg2 Re7!? 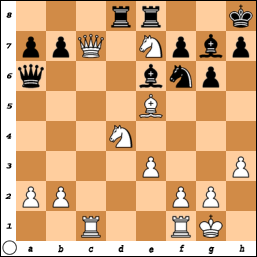 (46…Bg4 is good enough for a draw, but I thought I could maybe try for even more in White’s time pressure). The game ended in a draw after 47.Nxe6+ Rxe6 48.Qc2 Rd3 49.Qc7+ Re7 50.Qc4 Re5 51.Qc8 Re7 52.Qc4. Black has nothing better to do at the moment that shut White’s knight out on b6 with rook moves to e5 and e7, while if White takes the time to bring the knight back into the game (say via a8 and c7), Black can try to play …Re5, …Bd6, and …Rd2, planning …Rf5 next to target the weak f2-pawn. However, 52.g4!? was a rather interesting try and would’ve really made a mess of things given the time situation, although I’m not sure that is still enough for White to be clearly better. Still, given that Black wasn’t any better, 46…Bg4 was the correct way to go. Still, a draw with Black against another GM was not a horrible result, especially as it was my first outing in the main lines of the Slav. Another round, another GM! After my long with Shaba in the morning, I expected to play down, but I had no such luck. Actually, it wasn’t such a bad pairing, since I was hoping to play good players, and to get the white pieces meant I could probably do a bit more damage that I had previously. 15…g5 appears to be a new move (15…Nc6 has been played before, but Black is in trouble regardless). Despite his extra piece, White has a pawn deep in his position on e6 and the rook on a8 is lost. Giving back a knight on c6 frees the rook, but White’s still up a pawn with a better position to boot. After 15…g5, 16.Nfe2 is quite reasonable, but I spent some time and played the very strong 16.0-0-0!!. Black can’t safely take on f4 because after 16…gxf4 17.Bxf4, 17…Qh5 loses to 18.Qxa8; 17…Qf5 loses to 18.Bh6+; and 17…Qxe6 loses to 18.Qxa8. The only tough move from my point of view was 16…Be2!. 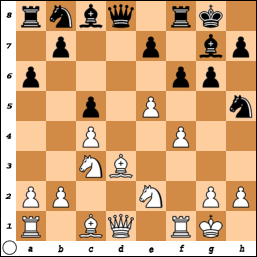 I had then planned 17.Bh6+ Ke8 (17…Kg8 loses to a beautiful idea: 18.Nxe2 Qe4 19.Nc3! 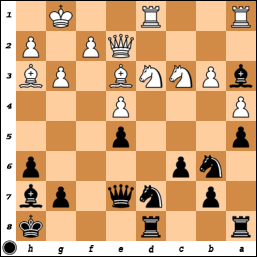 !, as after 19…Qxf3 20.gxf3, Black has no good way to stop 21.Rhg1+!) 18.Qxa8 Bxd1 19.Rxd1 Bf8 20.Bd2! (threatening 21.g3 or 21.Nb5) and White is still winning. As it was, there was a bit of extra excitement, as I played for the beautiful win rather than the prosaic one, and missed a key defensive opportunity for Black. It didn’t change the final assessment (White was much better/winning), but it did make me work for the full point a bit longer than I had anticipated. Still, a win is a win, and this brought me up to 4.5/7 heading into the final day. The final day saw the tournament begin at the early hour of 10 AM. The previous morning rounds had taken place at 1 PM and 11 AM (twice). The problem for me this game was partly the early start, but also that I was supposed to play GM Jaan Ehlvest with the white pieces (the pairings had been posted the previous night). A few minutes before the round, however, the pairings changed for seemingly no reason. Kuljasevic was supposed to have the white pieces against Marc Esserman, so he was at least prepared to play with white, and in fact, after the game, said he knew I’d play this line and had looked at it accordingly (he showed up about 10-15 minutes late for the game). I missed this little detail, and so I played 22…Rac8?, both in order to guard the c5-square after …cxd5 in that line, but also to make a8 available for the knight, so that it could go to e6 via c7. This was much too slow and too subtle to work though. After 23.Bh3! Na8 24.Nb1! 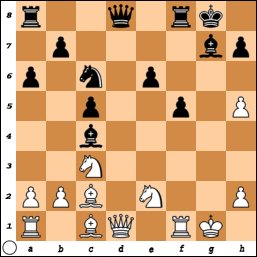 Bd6 25.Nd2, White had regrouped quite nicely while Black was all bottled up on the queenside. Davorin put me away pretty easily to send me to my 2nd loss of the tournament. This was another game in which I played someone with a higher USCF rating (although Kaminski has a lower FIDE rating; the other 5 higher USCF players were also higher in FIDE), but they had mysteriously dropped Kaminski’s rating to 2291 mid-way through the tournament. It was all the more amusing since for the first half of the tournament, he was the only player to take half a point off Marc Esserman (2350), who had otherwise rampaged through the field with Robson. I played 17.0-0! Qxc3 18.Rb1! [not going in for the attractive, but bad, 18.Qxb6 Qxa1 19.Qxb7 Rc8! (not 19…Rd8? 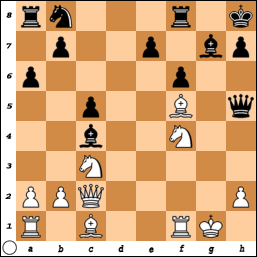 20.Nxc4 0-0 21.Bg5, winning), when White is hard pressed to prove an advantage anywhere and should start playing defense]. After 18…Nc8 19.Nxc4 Qxb4 20.Rxb4 Bb5 21.Bf4 Ke7 22.Rc1, I had a large advantage. I ended up being ahead 2 pawns with 2 Bishops against Bishop and Knight (all the pawns on the kingside), and while I took my time to win the game, the result was not in much doubt. This win brought me up to 5.5/9, good enough for a tie for 10th-16th place and $108.33 in prize money. After starting out with 5/5, IM Ray Robson slowed down a bit, scoring on 2/4 to finish on 7/9. This was good enough for a tie for first with GM Darmen Sadvakasov, who beat him in the last round to catch up. However, Robson then won the armageddon blitz playoff to take the official title. Unfortunately for him, he only played 2 GMs the whole way, and so was ineligible for a GM norm. Marc Esserman was the other big story of the event, beating GMs Ehlvest and Mikhalevski en route to a strong 6.5/9 result. He too only played 2 GMs, but his result was good enough for an IM norm anyways. My fellow Bay Area chessplayers didn’t fare too well with Josh Friedel withdrawing after having 5.0/8 and David Pruess scoring 5.5/9.